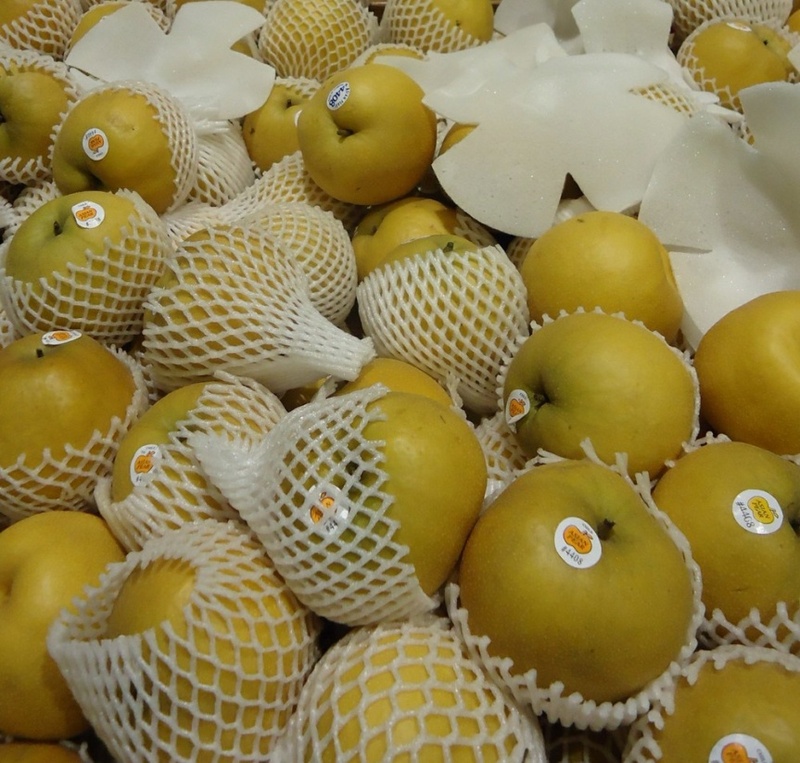 Super Healthy Asian Pears Make Super Leather! Despite a sweetness on par with other pear varieties, Asians sit on the low end of the glycemic index at 25.9, have a low a glycemic load of 3.367, and contain about half the carbs of regular pears. And they’re known for their crisp, apple-like crunch, floral aroma, and mild pear-flavor that distinguishes them from regular pears. And they are high in fiber, low in calories and contain a number of micronutrients that benefit blood, bone and cardiovascular health. 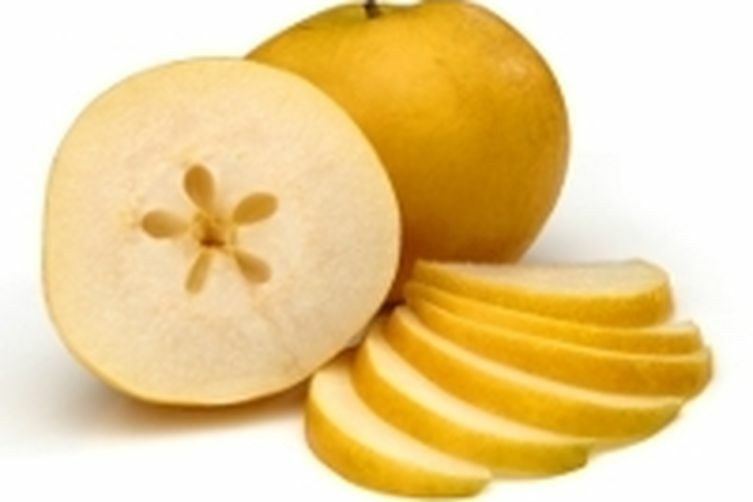 For instance, one large Asian pear contains 116 calories and only 0.6 grams of fat. And they’re loaded with fiber (essential for intestinal health, healthy blood cholesterol, blood pressure levels and feeling fuller longer). Daily recommendations for fiber vary with age and gender, ranging from 25 to 38 grams. As such, one large Asian pear provides between 26.1 and 39.6 percent of daily intake. All this, coupled with the relatively low caloric content of an Asian pear, can help attain or maintain a healthy body weight. Then there’s the high potassium and low sodium make-up of this fruit. Their high potassium content helps counteract the high sodium content in other foods. The proper functioning of all your body's cells, organs and tissues relies on a healthy balance of electrolytes. Two of the most important electrolytes are sodium and potassium. 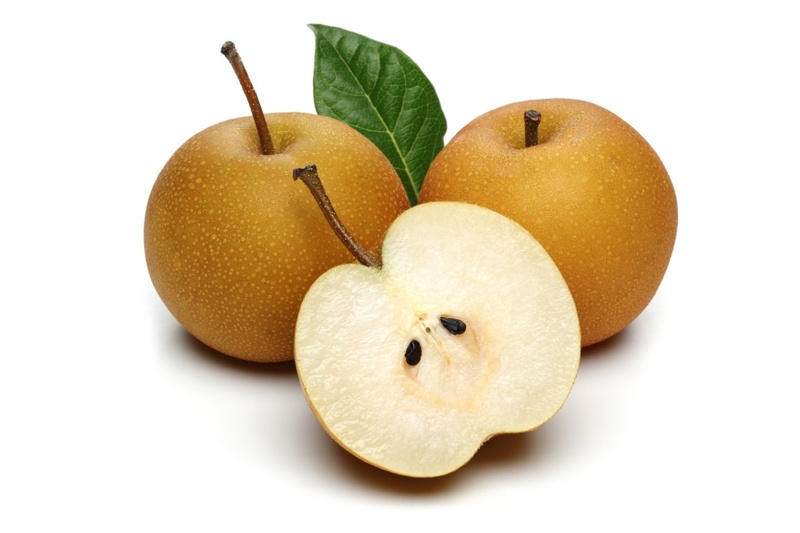 Asian pears contribute to this balance by being sodium free and providing 7.1 percent of your daily potassium. This is particularly important for its effects on blood pressure, as reducing your sodium intake and increasing your daily potassium can help to lower it. Next is the vitamin K content. It’s important for bone health and vital to your blood's ability to clot, or coagulate. This fruit provides 13.8 percent of a woman's and 10.3 percent of a man's daily vitamin K, so the Asian pear can play a significant role in maintaining the regular functioning of your blood. Another important micronutrient for blood and bone health is copper, which is essential to the production of energy, red blood cells and collagen. One large Asian pear contains 15.3 percent of your daily copper. And Asian pears also have a high concentration of vitamin C (important for the growth and repair of bodily tissues, healing wounds and repairing and maintaining bones and teeth). Similar to copper, vitamin C boosts iron absorption and plays the role of an antioxidant in your body. By removing free radicals from your body, these antioxidant effects add cancer prevention to the list of health benefits of Asian pears. When it comes to storage, select the most fragrant and un-bruised fruit with little to no brown spots. 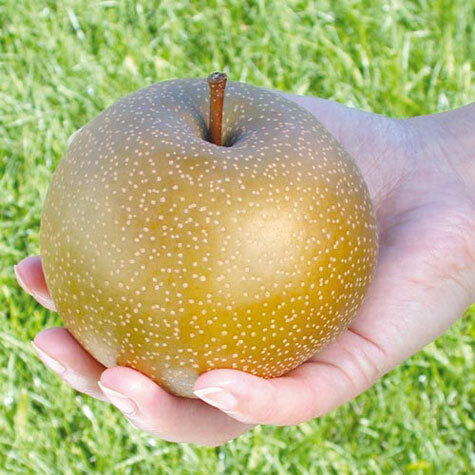 Ripe Asian pears are hard and do not soften (unlike traditional pears). They’re ready to eat when purchased. And while they store for only about 1 week at room temperature, you can keep them up to 3 months in the refrigerator. Although delicious on their own, the light sweetness and crispy texture of Asian pears makes them a unique addition to any salad or stir fry. They have a tender skin, so there’s no need to peel them. One of our favorite uses is adding them diced to chicken salad. They’re also scrumptious when thinly sliced and added to crisp greens with chopped nuts and vinaigrette. Finally, because they aren’t as grainy as other pear varieties, this super healthy fruit makes super fruit leather. So I’ll close here with my favorite Asian pear leather recipe. Meanwhile, this is their season, so if you aren’t familiar with this healthy fruit, give it a try! This is a “to-taste” recipe. Depending on how sweet or tart or spicy you want the end result, will determine the amount of sugar (if any), lemon juice (needed to prevent darkening of puree), and spices you will use. 1. Rinse, taste, and prep the fruit: Rinse fruit and chop. There is no need to peel the Asian pear as its skin is so thin. Including the skin in the puree adds extra nutrition, as well. Puree the chopped fruit. Taste the pureed fruit. Note its level of sweetness. If very sweet, no sugar will be needed. If still a little tart, you may need to add some sugar in the next step. 2. Cook fruit with water, sugar, lemon juice, spices: Place fruit in a large saucepan. Add a half cup of water for every 4 cups of chopped fruit. Bring to a simmer, cover and let cook on a low heat for 10-15 minutes, or until the fruit is cooked through. Uncover and stir. Taste the fruit again to determine what and how much sugar, lemon juice, or spices may be needed. Add sugar in small amounts (1 tablespoon at a time if working with 4 cups of fruit), to desired level of sweetness. Add lemon juice one teaspoon at a time to help brighten the flavor of the fruit. Add a pinch or two of cinnamon, nutmeg, or other spices to augment the flavor. Continue to simmer and stir until any added sugar is completely dissolved and the fruit purée has thickened, another 5 or 10 minutes (or more). 3. Pour purée into lined baking sheet: Line a rimmed baking sheet with sturdy plastic wrap (the kind that is microwave safe). Pour out the purée into the lined baking sheet to about an 1/8 to 1/4 inch thickness. 4. Slowly dry out in oven at a very low temp: Place the baking sheet in the oven, try to keep any plastic wrap from touch the sides of the oven or the oven racks. Also try to make sure that the plastic wrap hasn't folded back over on top of the purée. If this happens, the purée won't dry out. Heat the oven to a low 140°F. If you have a convection setting, use it, it will speed up the process and help dry out the purée. Let dry in the oven like this for as long as it takes for the purée to dry out and form fruit leather. We usually keep it in the oven overnight, so about 8-12 hours. 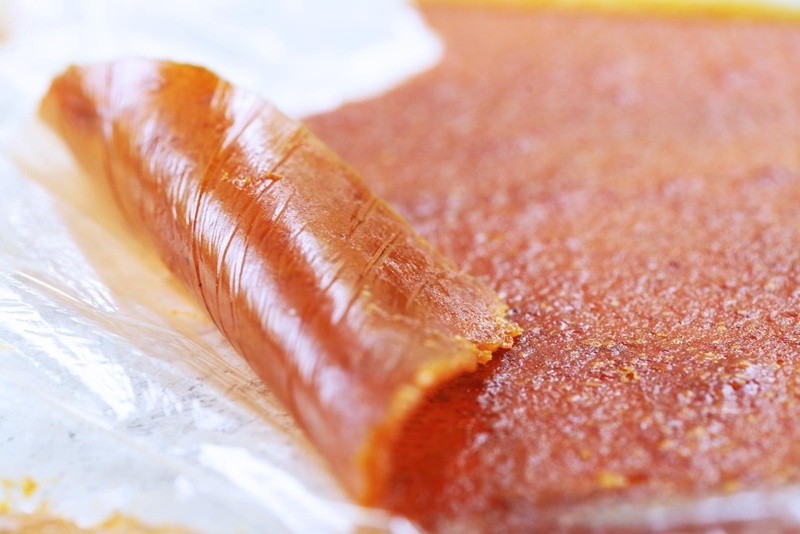 The fruit leather is ready when it is no longer sticky, but has a smooth surface. Alternatives to the oven: food dehydrator; outside on a sunny day inside a covered grill (leave puree covered entire time); or outside on a sunny day, covered with some cheesecloth. 5. 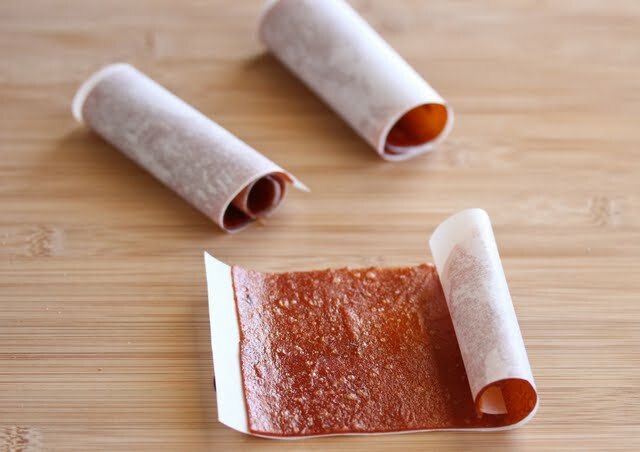 Roll up in its plastic wrap to store: When the fruit leather is ready, you can easily peel it up from the plastic wrap. To store it, roll it in its plastic wrap, put it in an airtight container and store in the refrigerator or freezer. A Yummy Recipe Using Honey and Why You Should Take a Stand! Measuring Tips so Your Baked Goods Turn Out Perfectly!